“The heavens proclaim God’s glory,” begins the shepherd king, and one wonders if David could see the heavens as revealed to us by the HST (Hubble Space Telescope), if words would have completely failed him. 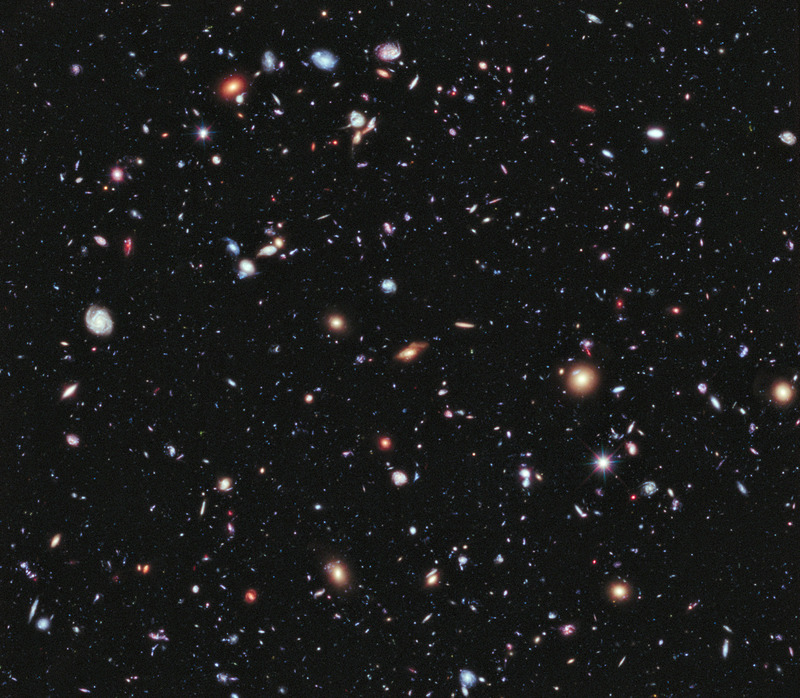 Astronomers keep raising their projection of the number of galaxies in the universe. They currently estimate about 500 billion galaxies. NASA has named the above shot, “XDF,” or “Extreme Deep Field.” Periodically over the years HST has trained its various scopes for extended periods on what the experts thought was the darkest, emptiest part of the sky – a box 1/10 the diameter of the moon. Through various time exposures with different instruments, they were surprised to learn that their dark little target box in the sky contains approximately 5,500 galaxies. You can learn more about the Hubble and the XDF image HERE. The bright white star near center-right, and the orange or red fuzzy blobs are actually stars between us and the galaxies in the deep field. If you click on the above link you will see the full image, and if you click on the image itself, you will see still more. Now let’s join the heavens in proclaiming more of the glory of God! not to mention everything else in the heavens surrounding it, let’s put all these thoughts together. The ‘average’ galaxy contains about 100 million stars, and untold hundreds of millions of planets, planetoids, moons, asteroids, and who knows what we have yet to learn about. Well, fact is, He knows what! He knows every one of these objects of His creation, as intimately as He knows you and me. He calls them all by name! He is as present among them, as He is among us (omnipresence). He is as highly attentive to every one of them, as He is of us. If sparrows don’t fall from the sky without His knowledge and if the hairs on our heads are all numbered, that is a staggering amount of omniscience! Yeshua describes himself as ‘gentle and humble in heart.’ Isn’t that amazing? If there was ever a one who could command instant servitude and obedience, this would be the one. And yet, this One, this Maker, Knower, Sustainer of a universe beyond our comprehension approaches us, ‘gentle, and humble in heart.’ Oh, my! Precious Creator, Father God; grant through Ruach Hakodesh that we may reflect You, with gentleness, and humility of heart. In Yeshua’s unequaled name, Amen.